Mao is an Honor Student and son of the chairman at Maritsu Evil Academy. He has not once shown up to class, nor has he ever participated in any school activities such as homework or volunteering. He has a brain with an Evil Quotient of 1.8 million, and uses it to conduct experiments and evil research. Not caring about other people's problems, he will often take what he wants and use force to rule over others. He is willing to do whatever it takes to defeat his father, even if seems stupid or is not something he likes to do. Despite his hatred for humans and heroes, he continually studies them, even keeping an observation journal to record his data. He believes that by learning about them, he can find a method to overthrow his father and take the title of Overlord for himself. Whenever he finds a subject for experimentation, his glasses will fog over and he'll begin laughing to himself. If it's for the sake of reaching his goal, he'll ignore everything and charge straight ahead. Rasperyl is the childhood friend of Mao, who goes by the nickname Beryl. She's considered a delinquent by Netherworld standards since she does good deeds and follows the rules. Like a typical delinquent, she speaks in a rough manner and refers to herself in a low-class manner. The reason she is pursuing the path of a delinquent is because she wanted to be unique compared to other demons. For the sake of adding to her delinquent reputation, she will jump at any chance she gets. This includes doing her homework, volunteering, and going to class early. Raspberyl dislikes acting uncool and being just like everyone else. Her dream for the future is to become the Legendary Delinquent. A hero fanboy, who knows everything there is to know about heroes. He's very passionate about them, however he has a hard time acting like one due to his lack of confidence. He likes a princess in the human world, and admires Super Hero. His dislikes involve demons because they do things like kidnap his princess. He wishes to become a great hero like Super Hero, so he can protect his princess from being kidnapped. However, he had his title of hero stolen by Mao after losing to him in a duel. Without it, he slowly started becoming a demon, until he took Mao's offer of becoming his vassal. This old gentleman demon – known as Geoffery in the North American version – is very loyal to Mao, known to become over protective of him in certain situations. He's known to cover his failures by laughing them off and seems to be keeping a few secrets himself. His future goal is to watch and help Mao grow up to be a great Overlord. His dislikes involve any people who get in the way of that. There have been demons who say he's even stronger than Mao. 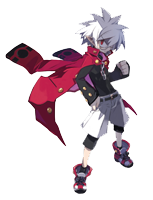 Jiiya was the one who found Almaz in the demon world and brought him to Mao, in order to help achieve his goal. He is willing to do anything in order to make Mao's dream a reality. He's a Home Economics teacher at the Maritsu Evil Academy and a master of High Heat-Style Chaos-School Kitchen Sword. He has strong faith in his cooking and his heart; he'll show up suddenly in front of Mao and the others, make a proclamation, and disappear like smoke. He dislikes cooking without heart or those who waste food. His dream for the future is complete harmony. He often gives good advice, but because he frequently uses cooking metaphors, a lot of what he says is ambiguous or cryptic. Asuka is the very loyal subordinate #1 of Raspberyl and addresses her as "oujousama" (my lady). She also happens to be the daughter of a high-class family. Her hobby is to send 1,000 paper cranes to opponents she wounds in battle, as a get well gesture. This has earned her the nickname of "Asuka of the Paper Cranes". Asuka dislikes brutality, though she will still fight for what she believes in. If she witnesses someone committing an act of brutality, she will punish the person. Her dream is to send a thousand paper cranes to a prince who has fallen from a white horse. This is her form of love. Lilian is subordinate #2 of Raspberyl. She's devoted to Raspberyl and calls her "oneesama" (big sister). Since Raspberyl has pink as her main color, Lilian covers herself in brilliant pink clothing. She takes the roll of the Explanation character, and seems to know everything about the school's history. 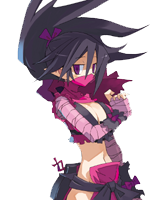 A female ninja known as "Lilian of Strength", her dream is to help Raspberyl become the Legendary Delinquent. She really hates brutality and will immediately attack an offender by throwing knives, among her many other weapons. Her policy is to fight fair and square, never attacking during the night. Rather she will challenge opponents in broad daylight, hoping for a good fight. A princess from a kingdom in the human world, she is the girl who holds Almaz's affections. Sapphire really loves cute things, but the truth is that she's a "killing machine" that rivals even demons. She cannot cry at sad things and there is a dark shadow in the depths of her heart. This page was last edited on 23 May 2009, at 18:19.